Thembi Kgatlana is the CAF 2018 African Woman Player of the Year, she’s a powerful player on the pitch and has become a football sensation. Thembi Kgatlana might be young, but she is cementing her status among the list of the most elite African players. Thembi is currently one of the most exciting footballers to watch on the continent. Kgatlana is a dynamic player with an impressive pace with which she dashes past defenders with ease. The 22-year-old has been instrumental in scoring winners for South Africa in their biggest tests. She put one past the Nigerian defence to secure a remarkable win for South Africa in their first group stage encounter and again in the semi-final win against Mali in Ghana. AWCON 2018 was an especially important moment in her career and has solidified her as one of Africa’s top talents. Kgatlana netted 5 (the most goals for a player in the tournament) crucial goals that saw Banyana Banyana qualify for the world cup for the first time after coming close on many occasions. Nigeria took the AWCON title this year, but the top player of the tournament was definitely Kgatlana and she rightly took home the player of the tournament nod. Thembi Kgatlana of South Africa runs with the ball during the Women's Group E first round match between South Africa and China PR on Day 1 of the Rio 2016 Olympic Games at the Olympic Stadium on August 6, 2016 in Rio de Janeiro, Brazil. Thembi began playing football at the age of seven. Her mother admitted that she was reluctant about her playing the game, but Kgatlana was convinced that she would be able to make something of herself in the game. Female players on the continent have to struggle with the added pressure of defying social norms that generally associate playing football as a masculine activity. There aren’t as many opportunities for female players in South Africa, Kgatlana herself pinned most of her hopes for a professional career in foreign leagues. Fast forward to February 2018, after admittedly a long wait, Kgatlana signed her first professional contract with the Texas National Women’s Soccer League (NWSL) outfit, the Houston Dash from the University of Western Cape. She joined fellow Banyana teammates Linda Motlhalo and captain Janine van Wyk. In her first season in the NWSL, Kgatlana scored two goals in 16 appearances. CAF Awards happen to be the biggest night for African football, celebrating the best of the best every year. Kgatlana was a big winner on the night, taking home Woman Player of the year as well as Goal of the Year awards. Considering the competition she was up against, including the 2017 winner Asisat Oshoala, it’s abundantly clear that Thembi Kgatlana owned 2018, both in terms of her AWCON performance and her first big professional move to the Houston Dash. She dedicated the award to women playing football in South Africa, also taking to Instagram to express her gratitude to “ every single one of you who has supported me through my highs and lows”. 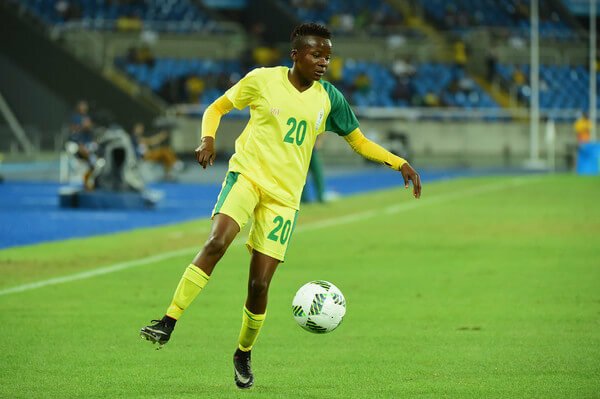 After the big wins for Kgatlana, the spotlight is on the young woman from Mohlakeng, Randfontein, who became the second South African after Noko Matlou in 2008 to win CAF Player of the Year. Off the pitch, like any other superstar athlete, she has a brand endorsement with Nike. We should expect much more to come from the Houston Dash Player both on and off the pitch. She will play a massive role when Banyana embark on their maiden World Cup campaign in France this July.